"How can one be so rooted in a land and yet so ruthlessly push it forward and reinvent it?" 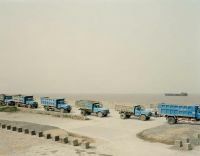 Between 2005 and 2007 Nadav Kander traveled the Yangtze River five times upstream from the mouth at the East China Sea to its source in the Qinghai Plateau in Tibet. 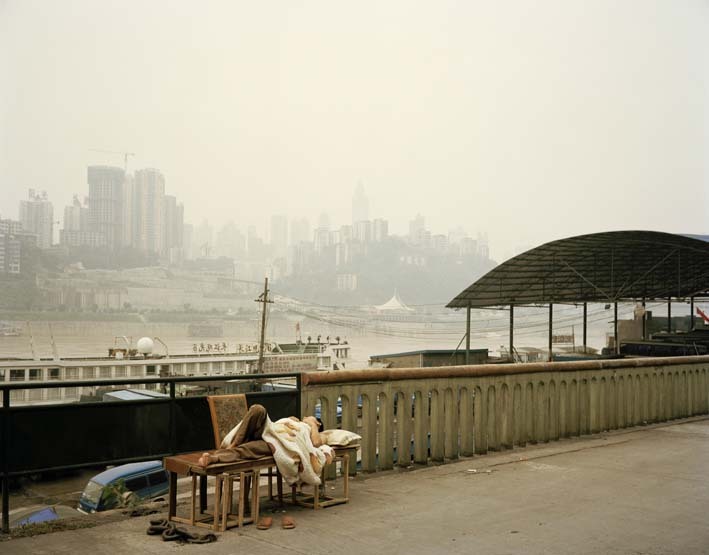 The photo series Yangtze - The Long River was photographed never more than 20 miles away from the river and documents the profound changes occurring in the landscape at the riverbanks as a result of rampant modernization in China. 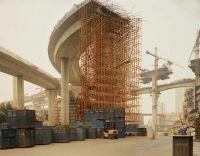 Mega projects like the Three Gorges Dam and the South-North water transfer system, huge bridges, and Western-style high-rise apartment blocks cut wounds into the landscape and rob it of its beauty and idyll. Tradition and the Modern exist irreconcilably side by side on the "Great River," which plays a constant important and identity-giving role to the Chinese, historically as well as spiritually. 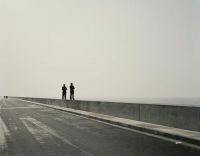 Nadav Kander photographs misty landscapes whose yellows and grays evoke the color of air pollution, landscapes that are marred by massive structural intervention in the name of progress. Protruding over the river, sections of bridge still under construction strengthen the reference to the rapid economic change by emphasizing the processual. This implicit dynamic captured in the image connects in a tense relationship with the vastness and tranquility of the contemplative landscape. 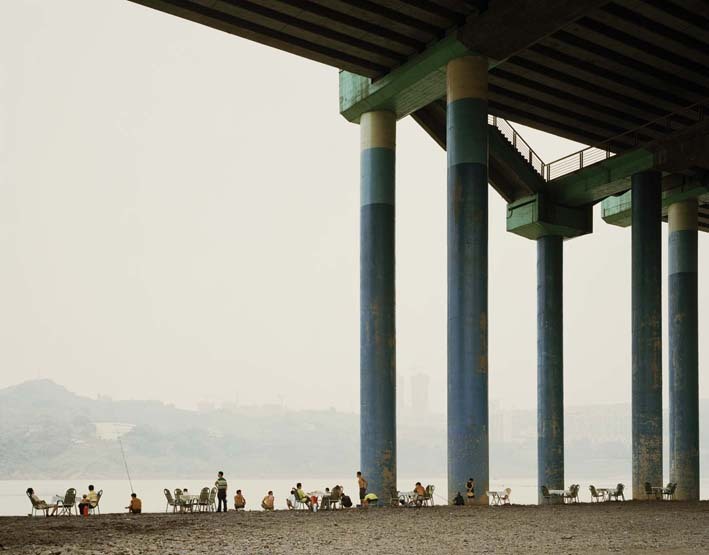 Lifted out of its socioeconomic context, Kander's photographs possess the melancholic beauty of romantic landscape painting — for example, in the image of people picnicking under the huge bridge piers in Chongqing with a small Chinese boat anchored nearby. The people at the river are constantly present in Kander's images, but always seem small and lost given the size and grandeur of the landscape on the one hand and the power of progress on the other. With no possible influence over the development, the residents must accept the unstoppable change in their environment and come to terms with fact that the landscape of their childhood no longer exists. To be able to experience the landscape as a constant has become a foreign concept to many. The landscape of the Yangtze River Nadav Kander sees as a symbol of an unnaturally fast and often inhumane progress. 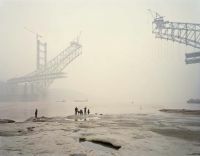 His work is a personal reflection on the social and ecological consequences of the economic development of modern China. 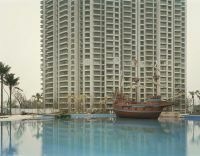 Kander's photo series is characterized by its multiplicity, which rejects an unambiguous classification in a photographic genre: thought-provoking documentary photography mixes with an artistically inspired landscape and architecture photography that invites mediation. 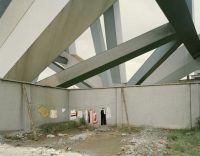 The clear formal vocabulary of the of the series is able to reconcile opposites on an artistic level: the excesses of human intervention are indeed a blemish on the landscape, but a blemish that as an interesting detail of a careful composition often lends the image charm and beauty. 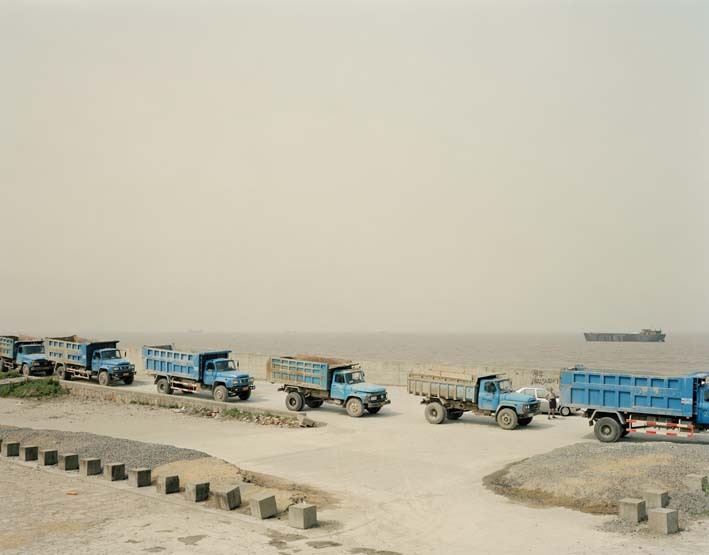 These "paradoxically beautiful photographs," as Kofi A. Annan aptly states in the introduction to the monograph Yangtze - The Long River, "speak to a larger truth. They remind us of the fragility of our world and of the damage we have done — damage that is not constrained by national boundaries." 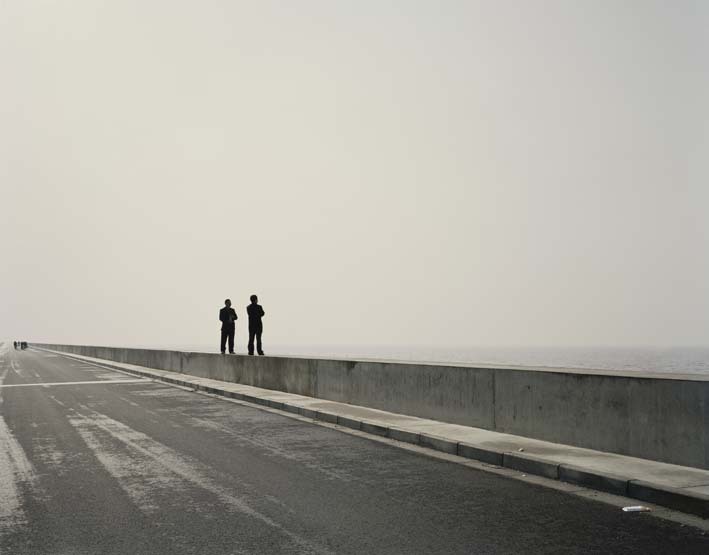 Nadav Kander, born 1961 in Israel and raised in Johannesburg, South Africa, is one of the most respected photographers of our time. He began taking pictures as a teenager and later printed aerial photographs for the South African Air Force after being drafted into the service. Kander's photographic range includes artistic, editorial, and advertising works, which have appeared in numerous books and magazines like Sunday Times Magazine, Rolling Stone, Another Man, and Dazed & Confused. In 2009 the New York Times Magazine dedicated an entire issue to Kander's "Obama's People," a portrait series of the cabinet members and closest staff of President Barack Obama. Kander has recieved numerous awards and was named International Photographer of the Year in 2009 by the Annual Lucie Awards. In the same year he won the Prix Pictet for the Yangtze - The Long River series. 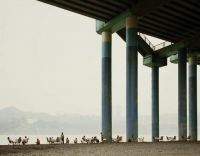 This famous photo prize is dedicated to the theme of "sustainability" and shows the work of photographers who have most vividly documented environmental degradation and exploitation of resources. 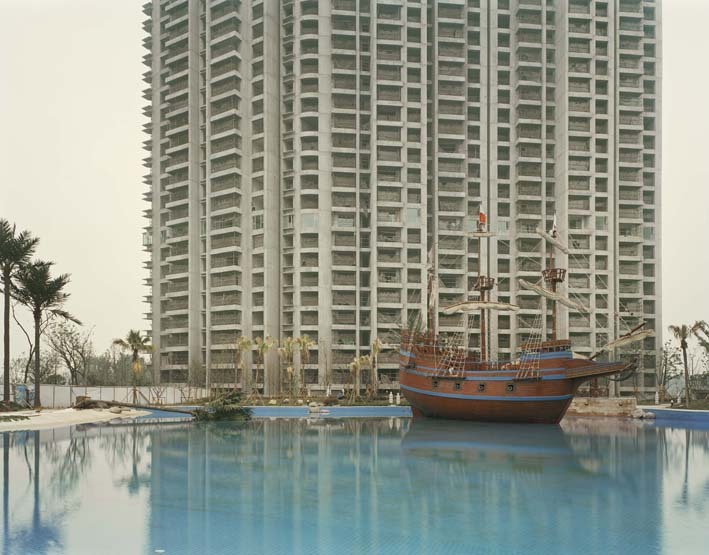 Nadav Kander has lived with his family in London since 1986. His work is part of the collection of the National Portrait Gallery and as well as the Victoria and Albert Museum in London.